They will never be satisfied. They won’t celebrate (and they won’t use punctuation either). Every year when Australia Day comes around, there are always attacks either against Australia Day itself or against the Australian flag. This is par for the course, as Leftists, Multiculturalists, and anti-Australian cranks have an ongoing political agenda of trying to undermine and sabotage any celebrations and icons of the Australian national identity. Jeff Kennett, the ex-Premier of Victoria, has come out with a call to change the date of Australia Day. This should be no surprise, as Kennett was a big-time supporter of the political ideology of Multiculturalism when he was Minister for Immigration and Ethnic Affairs; in fact, when he became Premier, in an unusual move, he made sure that he was also Minister for Multicultural Affairs — which lets us know that he is not a friend of traditional Australia. Kennett wants to change Australia Day to the 1st of January, but it should be quite obvious that such a change would conflict with New Years’ Day — it’s a remarkably stupid idea for someone who is supposed to be intelligent. Unless, of course, Kennett doesn’t really care about the Australian nation, but is instead seeking some sort of Multiculturalist or Politically Correct utopia. So, what’s Jeff’s big argument in favour of New Years’ Day becoming Australia Day? “I think it means something and doesn’t offend anyone” is what Kennett said — that line of reasoning may convince every Cultural Marxist in the country, but it certainly wouldn’t persuade any true blue Australians. Various journalists have also been spruiking about their desire to get rid of the 26th of January as Australia Day. Of course, the word “journalists” is used advisedly, as it is quite clear that a large number of so-called “journalists” are in fact non-party politicians, pushing their political wheelbarrows whenever and wherever they can. The majority of journalists are Leftists, and most of them have drunk the cosmopolitan Kool-Aid — which should be no surprise, as the average journalist has spent about fifteen years in schools, being indoctrinated by Multiculturalist teachers, spending their final three years getting a degree in journalism or a related degree with a journalism major (Leftists dominate the education sector, where any openly patriotic teachers are commonly weeded out). The humanities subjects at universities have been dominated by Leftists for years, with Multiculturalist, Marxist, Socialist, and Greenie teachers indoctrinating students studying for a BA (Bachelor of Arts) — although, what with all of the Leftist brainwashing going on in the universities, it has been said that BA now stands for Bolshevik Activist. The ABC and SBS can, of course, be relied upon to push for a change to our national day — the ABC is notorious for being Leftist-dominated, as is SBS. Both of them are government-funded media, one with a Cultural Marxist bias, the other with a pro-immigration bias — or perhaps that describes both of them? The ABC even went so far as to use a child for its anti-Australian propaganda, with an article entitled “Australia Day date change urged by young girl in heartfelt letter written in texta” — clearly it was meant to be some sort of propaganda designed to tug at the nation’s heartstrings. Perhaps we are supposed to react with something like: “Oh, look, a little girl wrote this; how touching, I think we’d better abandon Australia Day, after all” (insert heartfelt sob). Considering that the letter was sent in by the child’s parent, one has to wonder if the parent is a “bleeding-heart” Leftist who has been indoctrinating the poor kid, or if the letter came about as a result of the youngster being brainwashed at school. A true investigative journalist would have thoroughly looked into that — unless, of course, there is a cultural-political agenda being pushed at the ABC. Heaven forbid! Surely not? That would be impossible (unless it happens on a day ending with a “y”). The 26th of January celebrates the embryonic beginnings of the Australian nation, when Governor Arthur Phillip and the First Fleet established the beginnings of a settlement in Sydney, New South Wales. That settlement was the foundation of our nation, and is therefore worthy of celebration. Whilst our nation was officially formed on the 1st of January 1901, when the Australian colonies federated into one commonwealth, the beginnings of our nation on Australian soil began on the 26th of January 1788. 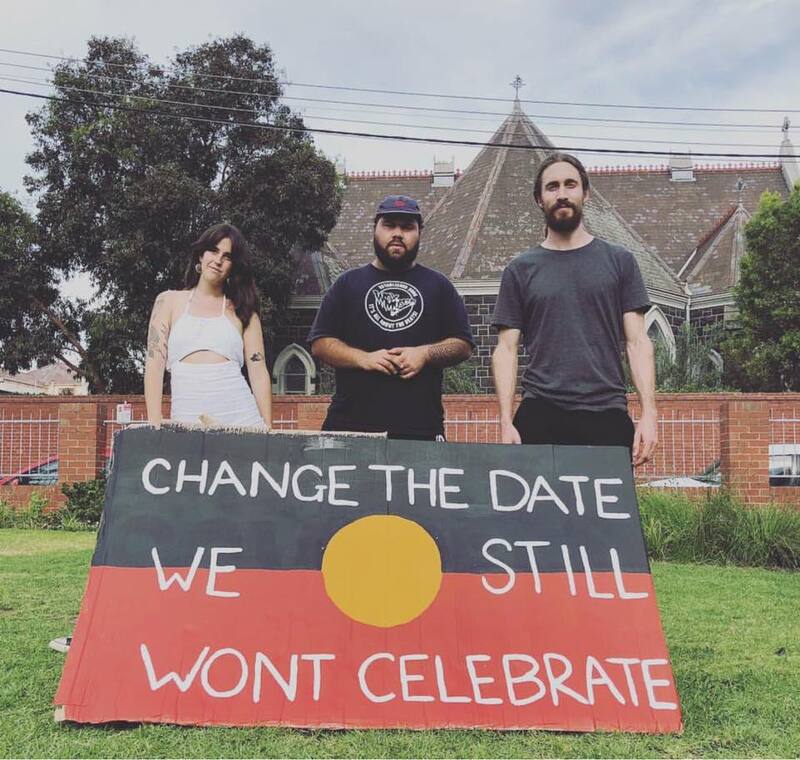 Some Aborigines don’t want to celebrate Australia Day — that’s fine, no-one’s forcing them to. Some complain because it’s not about them — well, not everything has to be about the Aborigines; not everything has to be “inclusive” of absolutely everyone; indeed, the Aboriginal flags which now hang in so many government offices are not inclusive either, they’re not representing the white community — indeed, nor are they representing the many multitudes of Africans, Arabs, and Asians now present in Australia. Let’s hope that all of those non-white people aren’t “triggered” by the Aboriginal flag not being “inclusive”. Australia Day celebrates the foundation of a new nation, a nation which is a part of the wider Western Civilisation. The day wasn’t meant to be for those who hate the Australian nation — it’s a celebration for patriots, for those who love Australia. As for the Multiculturalists, Cultural Marxists, and assorted nation-haters, it should be realised that they shouldn’t be pandered to — because every time you give in to a Cultural Marxist, they’ll just demand more. Like termites who eat away at the foundations of wooden buildings, the Cultural Marxists and their fellow travellers will never be satisfied until they have destroyed the whole edifice — such people are parasites upon the body of Western Civilisation; they are vermin who will destroy our nation, if we let them. We say “No more!” It’s time to draw a line in the sand. Australia Day is worth defending. Australia day is now defined by two things in the media-the citizenship ceremonies….which they show on the ‘news’ every year (usually featuring Sudanese or Indian ‘new Australians’) and the Australia day protesters who call it ‘invasion day’. But those who call it ‘invasion day’ never complain about the non-whites who are now invading the nation and becoming citizens on that day. Blatant anti-white racism. Ironically, if all the whites left tomorrow and returned to the UK, you can be sure that quite a lot of Aborigines would go with them, as they know they can’t cope without them…and that China would be circling like a vulture. If you take a plane flight from one side of Australia to the other, you’ll note that most of it looks uninhabited-why don’t the Aborigines live there? That’s right…..because they want to be where the whites have built a civilization for them. Australia was nothing when we arrived. It would be nothing if we left. Allow Africa to teach you something. F**k em, it’s when the first fleet arrived and that’s why it’s that date you dumb f**ks. Why don’t we change Christmas Day to another day? or New Year’s Day to another day? Shite they can’t even get the year right, it’s Christmas 2018 and it’s New Year 2019 not New Year 2018!!! What a bunch of twats. Obviously I wasn’t born here and thank Gott for that, can you get any dumber? I find it truly amazing how these so called celebrities bang on about the British Invasion and then make a motza oot of the Australian day celebrations e.g. Jimmy Barnes, John Paul Young Guy Sebastian etc. where have they been for the past year? In a cave? You want the TRUTH weel I’m not holding anything back and I’m sick of it all so they can all go and get f**ked, PC pricks, the wheel is turning as it always does and you’re either on board or not. The VOLK are sick of all this shite and we have had enough, so forewarned is forearmed. As for calling us Nazis, a word coined by the stupid British of the time, they wouldn’t even be able to tell you what it actually meant, it is short for NSDAP. Nationalist Socialist Deuchland ARBEIT Party!!! !